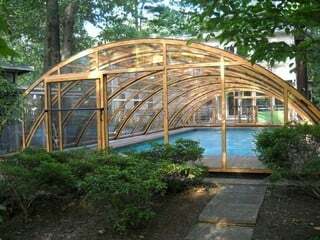 “I am very happy with my purchase of a pool enclosure, and with the quality of product and installation from Pool and Spa Enclosures LLC.I love to swim, and my dream was a house with a pool and fully retractable enclosure to swim year round. I researched enclosures from several companies, for more than three years, while searching Northern Virginia for my permanent house with a pool I could afford. I spoke with companies with more expensive products I could not afford, and with companies with less expensive products with less beautiful design and colors options. Pool and Spa Enclosures worked with me, not only to make sure the enclosure fit my pool and deck dimensions but my budget. I have not had to empty the skimmer baskets of leaves since install. The enclosure saves in other ways. Since install, I have not turned the pool vac on, and may remove it. I switched from weekly to bi-weekly service. The technician put tabs of chlorine at a low setting and has not had to add any chemicals yet whatsoever in almost two months. The water is and stays cleaner. Inside is beautiful, like being at a hotel. I have a beautiful view from the front of my house to the back yard, with tall glass windows, and worried the enclosure might obstruct the view. But the design is so attractive it lends an architectural look. With careful selection of finish and design to fit the house and yard, it does not detract but ads. 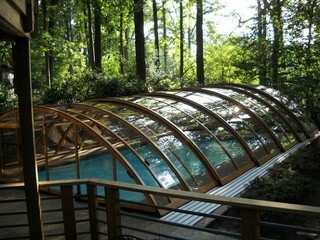 Visitors love it and just think it is cool the way it retracts completely off to the back of the deck. After a small dinner party a few weekends ago, to my surprise instead of retracting the cover, everyone wanted to sit inside!